Warlords games next release is set in one of the most famous universes ever created for science fiction, Dr Who, now with such a massive fan base for The Dr across almost every generation still alive and his pretty much worldwide appeal, this game is probably the most eligible game ever made for auto success, bringing even more people into the hobby, so with that in mind how have Warlord Games fared? Inside the exterminate box set is all the things you need to play, paper mat, recruitment cards dice and more importantly a force of Daleks and Cybermen, two of the most recognisable of Dr. Who’s enemies, the models are colour coded plastic so you can get into the game pretty quickly. The Cybermen models go together really quickly and easy but with only two body positions and three arms it’s not going to be long before you are duplicating models although you can alter the angle of the arm, the models themselves look nice it’s just a pity there isn’t more variation, the Daleks, on the other hand, there is no variation, they are Daleks so other than the paint job there all identical, just getting the front panel of the model in caused minor irritation, but for such a cheap entry level box the quality of the models is better than I was expecting and it’s obvious what everything is supposed to be. Designed to be a quick and easy game to play that is accessible by all ages the rules are quite light, everything you need is split into three pamphlets, Rules probably the most important one, everything is straight forward and only three main phases of play, move shoot and melee the other two books are where the fun starts Guide to the Time Vortex is 6 scenarios of various types which you can play out including special victory conditions if you choose to take a Dr. The third pamphlet is a solo mission for players wanting to play the Dr against Daleks or Cybermen in a solo environment, but you could probably use any faction to play with. 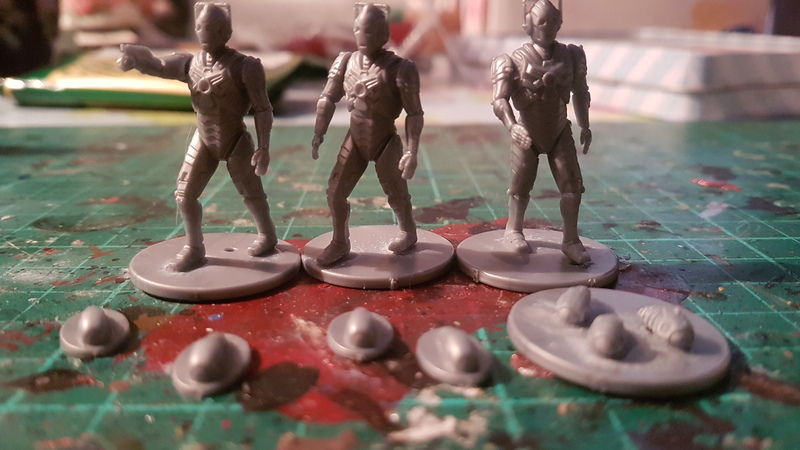 There seems to be some minor confusion with the Cybermen as to just how many bases you can take but hopefully this will be rectified in a FAQ, other than that the rules seem pretty straight forward in the run-throughs I have had I didn’t come across anything that wasn’t easy to find an answer to in the rule book, I am not a massive fan of the under fire rule as even a saved hit will severely impact on your plans for the turn, to take kill a player off is also a little convoluted, you roll the attack then the defense and compare the results, for every unsaved damage you then roll another dice and the highest of those dice results is the outcome, either nothing happens, the player is shocked (laid down until the upkeep), or exterminated, removed from play so in affect a model has two types of save, the armour save and the damage table result, this seems a little long winded, maybe it will grow on me I don’t know. The few sessions I have had with it now have been OK but hopefully the game will improve as time goes on, and hopefully, it will get more fun when I start adding in the Dr and other memorable characters to liven the game up. If you look closely at the back of the cabinet, you will see some off the forthcoming Cybermen which span several generations of Dr Who and hopefully will add a bit more variety to the collection. Two problems I had with getting started seem very trivial, but after such a good product release with Test of Honour I felt a bit disappointed with Dr Who, the cards are all mixed up, all the battle cards and character cards, all bundled together and mixed up in two card blocks, and the starter box has no insert like previous releases to separate said cards and dice etc from other components of the game. 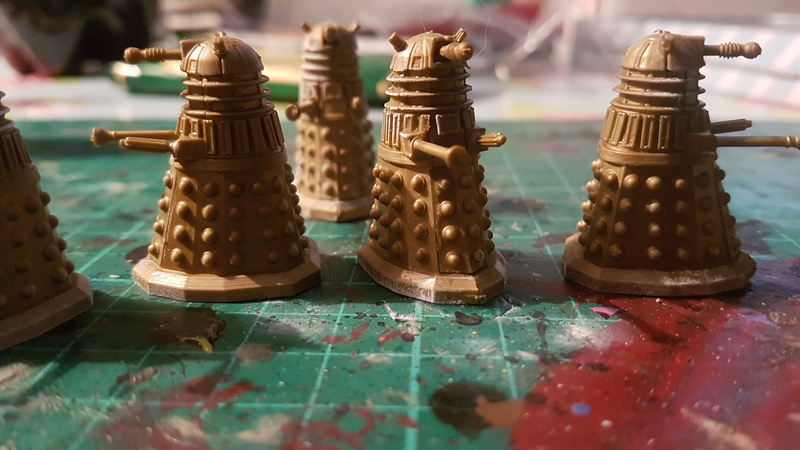 Overall not a bad game, it will probably take off more as and when Warlord release more expansions and character sets to go with it but as a fun way to get Dr Who fans into the hobby it is a reasonably strong start.